Cementitious acrylic high-standard white adhesive, suitable for glass block insatllations and joint filling. It has strong adhesion and high strength, it does not sag and it is highly resistant to moisture and frost. 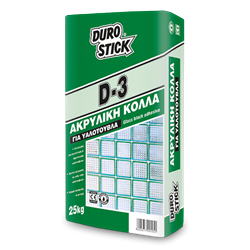 It prevents initial or future developments of surface hairline cracks on the grouted joints. Applies easily to any type of glass block, both indoors and out. Meets the requirements of DIN 18175 for the construction of building glass blocks. 12-15kg/m², depending on the size and type of the glass block.